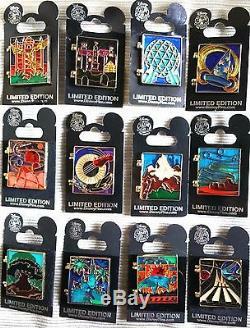 COMPLETE 12 PIN SET OF DISNEY'S 2010 WDW CAST EXCLUSIVE STAINED GLASS COLLECTION HINGED WINDOW PINS. VERY HARD TO FIND , NEW ON ORIGINAL CARDS! This is the full complete set of the 12 Walt Disney World Cast Exclusive Stained Glass Window Hinged Pins that were released in 2010. All pins are mint, on original cards. Haunted Mansion card is creased, the pin is mint. RELEASE DATE: JANUARY, 2010 - DECEMBER, 2010. ALWAYS From a Smoke-Free Home. In this set you will receive: 1. Pin 74978 2010 WDW Cast Exclusive Stained Glass Pin Collection - Castle with Mickey 2. Pin 74979 2010 WDW Cast Exclusive Stained Glass Pin Collection - Mission Space with Daisy 3. Pin 74980 2010 WDW Cast Exclusive Stained Glass Pin Collection - Dinosaur with Stitch 4. Pin 74981 2010 WDW Cast Exclusive Stained Glass Pin Collection - Tree of Life with Chip & Dale 5. Pin 74981 2010 WDW Cast Exclusive Stained Glass Pin Collection - Tree of Life with Chip & Dale 6. Pin 74983 2010 WDW Cast Exclusive Stained Glass Pin Collection - Space Mountain with Donald 7. Pin 74984 2010 WDW Cast Exclusive Stained Glass Pin Collection - Tower of Terror with Minnie 8. Pin 74985 2010 WDW Cast Exclusive Stained Glass Pin Collection - Living Seas with Crush 9. 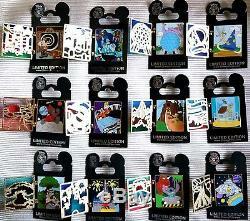 Pin 74986 2010 WDW Cast Exclusive Stained Glass Pin Collection - Spaceship Earth with Figment 10. Pin 74987 2010 WDW Cast Exclusive Stained Glass Pin Collection - Haunted Mansion with Ghosts 11. Pin 74988 2010 WDW Cast Exclusive Stained Glass Pin Collection - Expedition Everest with Pluto 12. Pin 74989 2010 WDW Cast Exclusive Stained Glass Pin Collection - Sorcerer Hat with Tinker Bell. Always from a Smoke-Free Home!! This information is provided by the carrier and excludes weekends and holidays. Note that transit times may vary, particularly during peak periods. The item "DISNEY 2010 WDW CAST EXCLUSIVE STAINED GLASS COLLECTION COMPLETE 12 PIN SET" is in sale since Tuesday, November 22, 2016. This item is in the category "Collectibles\Disneyana\Contemporary (1968-Now)\Pins, Patches & Buttons\Cast Member Exclusives".oblivion" and is located in Titusville, Florida. This item can be shipped worldwide.